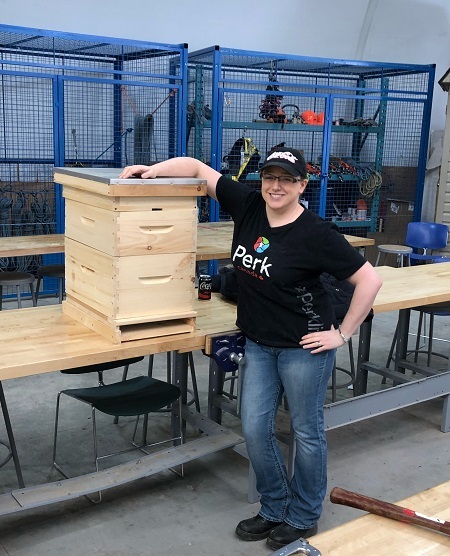 While the Perk.com Canada blog is usually used to showcase our marketing, publishing, and technical expertise, we decided to switch things up a bit to showcase why employees like myself love working at Perk so much. Sarah proudly showing off her beehive! Many companies offer comprehensive benefits plans that cover things like prescriptions, glasses, and dental care. Perk, however, goes even further, and offers employees a Personal Spending Account (PSA) that can be used for pretty much anything that improves the wellbeing of an employee, or an employee’s family member. Some PSA expenditures are pretty normal – gym memberships and workout equipment, health supplements, estate planning, and child or elder care – but others are a bit more, well, out there. My request was, according to Chris Nelson, Perk.com Canada’s Chief Operating Officer, definitely out there. In fall 2017, my husband and I moved to a 5-acre property about half an hour from Waterloo. With dreams of a simpler, more self-sufficient homestead, we began planning for our kitchen garden crops, chicken coop, and, as my personal project, beekeeping. Turns out, when done properly, beekeeping is good for the environment, easy enough to maintain, and produces a steady supply of delicious honey. A local beekeeper at the county fall fair suggested I take a course on the basics to get started. And wouldn’t you know – the Humber Arboretum offers a certificate in Sustainable Urban Beekeeping! I soon found out that interest-based courses such as this one are covered by Perk’s PSA, even though they don’t technically have anything to do with an employees job description. This encourages a work-life balance by giving employees the chance to explore their interests, and develop hobbies outside of work. BEES 010 (yes, that is the actual course code) covered the basics: types of bees, bee health and common diseases, basic apiary equipment, and a solid overview of beekeeping as a hobby. With guidance from my instructor, I’ve ordered my initial equipment (also covered by my PSA), picked a spot for my hive, and am now eagerly anticipating warm weather and the delivery of my first colony. You can be sure that I’ll be bringing fresh honey in for my coworkers to enjoy!